Limited Warranty 1 year Limited Warranty. For full details, visit the warranties page or call (800) 626-4686. Service Options Post-Warranty Basic, Advance Exchange and Depot; restrictions apply. Consumables ScanAid kits For full details, visit www.ImagingService.com or call (800) 626-4686. TouchTo combines the latest OCR technology with the Fujitsu touchscreen system to simplify the document management process by reducing the multiple steps required to get fields from scanned documents into backend systems. Anyone scanning a document can route data capture and metadata extraction results into applications from the scanning entry point. The technology has been designed so that anyone capable of operating a scanner is able to use this solution to capture paper-bound documents and data fields within those documents straight into archive, document management and accounting systems. Prior to the release, data extraction was performed on a separate PC, requiring one or more operators to input documents and process them in separate steps. Or, if data extraction were to be performed at the scanner, keystroking was required. With TouchTo, data extraction is performed by simply tapping on a word or number as the document is displayed on the scanner's LCD screen. Bolt Direct is a connector application that installs and runs on supported Fujitsu network scanners. It communicates with Laserfiche systems enabling users to scan, name, index and route documents directly from the scanner's touch screen and keyboard interface. Bolt Direct does not require additional connector management components making deployment simple and affordable. Bolt Direct does not interfere with other applications resident on the Fujitsu scanner. In operation users can select from the rich variety of Fujitsu advanced scanner settings to ensure high quality document images. An image preview feature lets users visually inspect image quality, rotate images, continue scanning or send to Laserfiche. Once send to Laserfiche is selected the touch screen display lets users log in, route to Laserfiche folders, name the document and index it (list fields are displayed and supported). When completed, the document is released to Laserfiche directly in real time. Construction Imaging's CaptureTouch - seamlessly combines the power of Fujitsu's 6010 network scanner, ABBYY TouchTo, and EMC's ApplicationXtender into a powerful solution for distributed capture. Users are guided through a wizard for classifying documents with the information required to store the document in ApplicationXtender's ECM repository and Construction Imaging's Invoice Router and Construction Document Manager.. When information is required from the scanned documents, users are directed to touch the appropriate information on the scanned document. The information is instantly captured through ABBYY's TouchTo OCR technology. Touch screen capture technology enables users to improve daily processes through it's innovative offering. The CaptureTouch - system is centered on document types. All the user needs to know is what document type they are capturing. An administrator or power user pre-configures the storage location and required data for that document type. When configuring a new document type, the ApplicationXtender repository is selected and a list of fields from that is available to be put into the wizard. Multiple screen types are available in the wizard such as a button input, keyboard input or touchscreen input via ABBYY TouchTo. CaptureTouch - is directly tied to ApplicationXtender via Web Services. Once a document is captured on the scanner, it is put directly into the repository and can be immediately accessed. ApplicationXtender is a platform that can provide content to a number of systems including Construction Imaging's Invoice Router - Web Access and Construction Document Manager - products. Other such integrations include pushing documents to SharePoint, Human Resources applications and ERP systems. Invoice review and approval is made possible using Invoice Router's Web Access module. Drivve LLC is pleased to present the Drivve | Image Fujitsu Edition, the latest dedicated version in our Drivve | Image lineup. Our set of feature-rich, customizable tools for capturing and processing document images is now made specially for Fujitsu's fi-6010N desktop network iScanner (and will support forthcoming models in 2009 and beyond). Together, Fujitsu and Drivve | Image enable collaboration at its most efficient: a high-performance, space-saving document workstation that increases productivity while decreasing cost by eliminating the need for multiple devices (printers, fax machines) combines with powerful image-processing and automation capability so users can customize and optimize their network scanning, emailing and faxing. With its ample touch screen and full keyboard, the fi-6010N offers the same input capabilities as a computer. Need to share or email your documents? Just scan them and file the optimized, searchable PDFs on your company's network while sending them to colleagues in any office around the world. Don't like complicated scan jobs? (Neither do we.) Choose any button on the elegantly designed UI and Drivve | Image guides you through a series of simple steps before handling the bulk of the processing details on its own. And when the Drivve | Image Fujitsu Edition is used together with Drivve's award-winning DMS, Drivve | DM, Fujitsu customers have an entire document ecosystem at their fingertips. Image Ramp - provides a simple and intuitive onramp that is ideal for your customers document capture needs. Protect your investments by creating integrated solutions around your own DM offerings or take advantage of our own cloud infrastructure. ImageRamp offers a configurable environment that is simple to use and meet your customer document needs. Create custom workflow buttons for your clients document processing needs. Set up index configurations into SQL based data repositories. ImageRamp is ideal for enterprise wide deployments. You can set up your customers devices through centralized FTP or UNC path locations or use a simple walk up USB configuration. Built in VNC services for remote control and diagnostics. The FileBound onboard capture integration allows users to control all the document scanning and indexing processes directly from the scanner panel. Users need only to load their documents into the scanner, select where within FileBound they want to store them, enter the index information, scan the documents and automatically save them into a local or remote FileBound system. The FileBound integrated capture software for the fi-6010N provides a complete, out-of-the-box content management solution without any additional hardware of software requirements. Organizations with business processes that rely on documents received from branch offices, remote locations or partners can receive those documents faster, more securely and accurately indexed by using the OnBase integration for the fi-6010N. This is particularly valuable in applications that affect revenue recognition or customer service, such as bank branches, insurance companies, lending organizations or shipping and receiving facilities. Because of its ease of use and small footprint, the integration for the fi-6010N is well-suited for environments with limited scanning experience and space. Centralized administration allows the destination OnBase system to control processes and impose consistency with minimal IT overhead. Capture your patient charts, loose paper/faxes with Inofile ChartMD. With or without an EMR, capturing and assigning documents to a patient record has never been easier. Inofile ChartMD works exclusively with the Fujitsu 6010N and N1800 network scanners. Bringing Structure to Unstructured Documents. It's a simple premise with profound impact for the healthcare industry. Inofile's technology is at the core of our product offering, allowing for the seamless transferring of clinical information based on proven and accepted healthcare standards. Our unique approach to document based information has been developed with the support of leading manufacturers, standards groups and industry experts. For clinics, extended care, long term care and hospitals, Inofile has a product that is right for you. Our distinct product offerings deliver on the promise of exchanging interoperable healthcare documents to enhance the effectiveness of patient care. By providing structure to unstructured documents, Inofile's solutions deliver better patient information and help to complete the patient record. Inofile is the preferred clinical document partner with Fujitsu, the leading scanners manufacturer in healthcare. Within the healthcare market Inofile has partnered with industry leaders such as Fujitsu, McKesson, Epic and Ricoh to provide innovative workflow improvements for ambulatory and acute facilities. For clinical document imports, scanning, uploads and exports, Inofile solutions deliver information with real savings, in real time. What's more, Inofile is an active participant and thought leader in the healthcare records standards community. From professional organizations to legislative agenda setting, Inofile is driving the conversation and helping shape the future of electronic medical records (EMRs). With or without an EMR, Inofile ChartMD allows you to capture clinical documents, loose filings and taxes so they can be accurately indexed to patient record. Inofile ChartMD is a standards-based interoperable healthcare software solution for capturing patient charts, loose filings and importing faxes into patient directory structure or directly to the EMR. KnowledgeLake Capture for the Fujisu fi-6010N iScanner enables users to scan directly to Microsoft Office SharePoint Server (MOSS) or Windows SharePoint Services (WSS) with corresponding meta-data for each document. The integration enables users to scan directly toe-mail, to a network folder or to a printer. In addition, the documents can be converted to TIFF, PDF, Searchable PDF or JPEG before stored in SharePoint. The Fujitsu fi-6010N iScanner coupled with KnowledgeLake Capture provides added simplicity, enhanced security and encryption features, a network control utility and an upgraded user interface to further assist collaboration across a global network. The web based centralized control utility allows network administrators to assign scanning profiles to users or groups of users and enables remote delivery of software updates. Kofax Front Office Server enables customer facing employees to trigger back office, business processes directly from familiar, front office equipment such as digital copiers and desktop scanners. Employees start processes with a few clicks at the digital copier ot thin client scan application. This office automation solution reduces the days required to ship paper into just minutes via electronic transmission. Time spent shuffling, tracking, and filing that paper is replaced by customer facing activities. This increased responsiveness and front office contact combine to produce superior customer service and reduce operational costs. Speed up document-driven business processes by capturing documents in the front office, where they originate, and quickly deliver them to the systems that automate business processes. Empower front office employees to scan documents without training and leverage additional functionality to improve user efficiency. Improve compliance efforts by tracking chain of custody from the point where a document enters a workflow to the final disposition in a back-office application. Easily deploy a front office based document capture and routing system with centralized management. Standardize on a single-vendor for document capture, collaboration and routing. Extend existing Kofax Capture workflows directly to the front office user. Through the integration with the fi-6010N, Office Gemini worked to think outside the box, and created the most efficient and high performance, space saving workstation by decreasing costs and eliminating the need for several devices to scan into 1 document management system. With Dokmee and the fi-6010N, users can manage and convert paper documents to digital images and store and access documents securely within Dokmee. 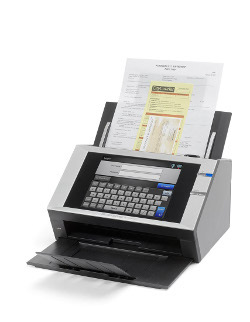 Users are able to scan and index documents from one centralized scanner. Documents are ready for immediate retrieval across the entire network. This extensive business solution is carried out at your finger tips. Our goal is to provide end users with the ease, convenience, and security of managing their documents through a collaborative and extensive business solution! The Fujitsu ScanSnap iScanner with the One Touch Global Technologies integration is the perfect transactional capture platform for enterprises, small businesses and satellite offices in banking, health care, insurance, transportation, government and legal. Integrate paper documents directly into your accounting/invoicing systems, line-of-business applications, document management systems, workflow, fax servers and more. Automate the indexing process based on full text OCR, user profile configuration or other business requirements. Looking to integrate with SharePoint? Just tell us how! One Touch Global Technologies understands how to integrate documents into to business workflows. For almost 20 years, One Touch Global Technologies has provided leading edge solutions to thousands of users processing millions of business-critical documents. Some of the top names in the healthcare, pharmaceutical, financial services, banking, transportation and government spaces rely daily on One Touch Global Technologies solutions.